Visual Studio Code>Other>PHP Getters & SettersNew to Visual Studio Code? Get it now. Fast generator of getters and setters for your PHP class properties. 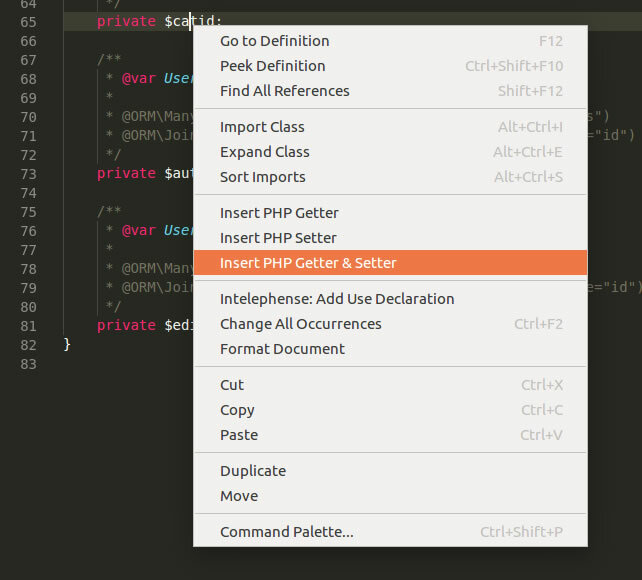 This extension allows you to quickly generate getters and setters with one single command. Detects indentation. No matter if you use spaces or tabs. Uses configuration options to show doc blocks as you like them. Generates method's descriptions based on the property description. Detects valid type hints to use them in the setter. Insert PHP getter and setter. You can also set a custom templates dir entering a custom folder in phpGettersSetters.templatesDir setting. Template Literals are used for templating because the flexibility they provide. With them you can easily create a custom template with no knowledge and also invest some time for complex things. For advanced usage you will have to google about template literals but here are 2 sample templates. As you can see a Property object is passed to templates so you can access any public method there. I also like the idea of adding more stuff as users find limits. Open an issue if you find something you cannot achieve. Fixed No property found when switching between editors. Thanks for reporting Carlos Alfonso Pérez Rivera!